For this week’s photo I decided to go back in time, way back to July of 2004. Bryan and I, along with his brother and cousin went on a mission trip to London, England for a whole week. At the time Bryan and I only had point and shoot film cameras so we decided to buy our first digital camera for the trip. We chose a 3 megapixel Vivitar that cost us about $100. At the time we weren’t thinking about being serious photographers plus that was all we could really afford. The pictures that we brought home weren’t great but they were decent. The picture below is one of my favorite photos I took on the trip. 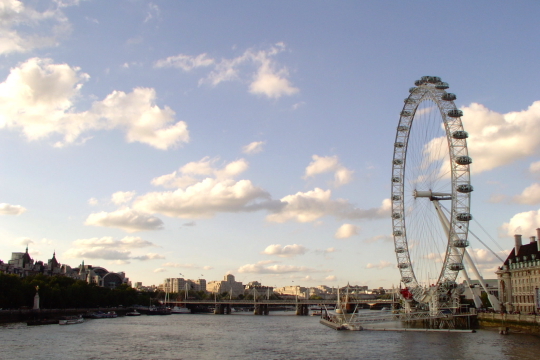 It shows the London Eye and the River Thames with nice white puffy clouds in the sky. I hope one day to go back to London with our Mark II and take this shot again. Photo Info: Taken with a Vivitar DC3320, ISO 100, F43.5 at 1/197 of a second.